96 different battings samples and counting... The process of making and testing them. Current list of tested batts: The last 6 I am waiting on additional bundles of their batting samples from Winline as they only sent me one sample of each. That will bring my total to 96 tested batts. 6. Heirloom Cotton Fusible- 80% cotton 20% Polyester resin bonding contains a fusible chemical that fuses to both sides. Sew Excited, I found a yet undiscovered (by me anyway) batting line and have requested samples to test. The company is called Winline. They may be available in your area but I have never seen it in Florida and only found them through an ad in MaryJane's Farm. They offer natural cottons, organic bamboo, polyester batting, blends of the afore mentioned and get this they will make a custom request batting or blend to fit your quilting needs. Best part they are made in the U.S.A. So look for a new additions to my batting sample line up soon...to be continued! Go watch this video on the Hobb's quilt batting site that will give you a peek into the manufacturing process. It shows the fibers being carded and cross lapped and needle punched and bonded. Makes some of the terminology I have taught you come to life when you can see what it is I was talking about, if you are a visual person like myself. I am almost finished hand quilting my Christmas Cactus quilt. I have used almost and entire 1000 yd. spool of YLI quilting thread. I am using Hobbs batting in this quilt its the 80/20 cotton/poly blend called Heirloom. I really wish the American batting manufactures would come up with a cotton/wool blend with more wool than what is currently available. Wool has the strongest tensile strength so it can bend back on itself over and over without breaking which translates to us quilters as no permanent fold lines in stored away quilts that don't get re-folded a different way often enough. It also has great loft that traps heat in the winter and that wicks and releases moisture in the summer. It quilts better than anything as far as needling and hangs beautifully too. The only draw backs I can see are allergies to wool (if that is an issue for you or the recipient of the quilt) and bearding which can be dealt with through bonding. 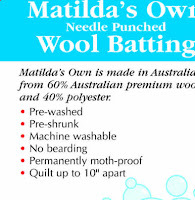 Matilda's has a 60/40 Wool/Cotton that I liked, but it is hard to find (made in Australia) so I think I will try to find a stateside source and order one for my next project cause that is the TRUE test using it in my own quilts. I have quilted so much on this quilt I made a hole in my Thimblelady thimble. I thought the dimple in the thimble was getting deeper from wear as I kept snapping the eyes on my needles (have gone through 3 packs of needles so far), the next thing I knew I went to start a row of stitching and jabbed myself right through the thimble. OUCH that smarts! I am hoping my jeweler can repair it for me, although I have been thinking maybe she has a guarantee on them so I may check out her website and see. I try to use a different dimple but my needle just wants to go there. Trying to force myself to do it is like trying to quilt left handed, makes quilting feel like an effort instead of relaxing. Remember if you see a new batting or batting line hit the market PLEASE remember to give me a shout! I am sorry I have not posted the results but its not because I have not done them it is because I still have not received the batting samples from Innovative Craft Products. I wrote them again but still nothing, so frustrating! I just don't understand as I spoke to them on the phone and they seemed excited to be included in my project. I got all ready to test these products as I love making totes and purses I had a personal interest as well. If I come across these products at my LQS I may go ahead and purchase and test for bag/tote making as I know how many quilters enjoy making these (even though we already have so many) It's "sew" addictive! New batting samples are on the way! I'll let you know what I think when I get my samples made. More batting samples on their way! 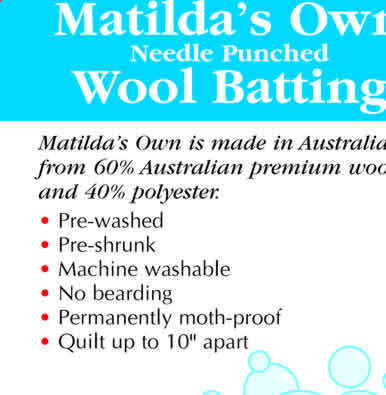 Finally was able to make contact with Matilda's and have samples of their batting line on the way!! Off to buy more muslin to prepare to make samples when the batting arrives! Welcome! Come on in and sit a spell, visit with me as I attempt to discover all that there is to know on the subject. Please write me with your questions and join up to follow this blog. We are bound to learn along the way. A good place to begin is with the terminology, there you will find batting terms you may be familiar with and some you may not that will help you understand the nature of batting. It’s pretty important stuff after all it’s the “meat” in the middle of these elaborate quilt sandwiches we make. Each batting was cut into two 12” squares for the quilting samples; they were layered and quilted by machine in ¾” grid between two squares of bleached muslin. One sample square from each brand of batting then received a single line of hand quilting to test for ease of hand needling. These quilted squares were then rotary cut to 9 ½” squares and bound. (Note: There are a few brands of samples that are cut to 8 1/2” because the what I received from the manufacturer were pre-cut 10”squares) One of these bound samples was then hand washed in hot water (as hot as my water heater would allow, which turned out to be 127.4 ˚F) with powdered detergent and dried in a hot electric dryer. Each brand tested will include an unquilted sample of each batting so you can examine each brand for hand, neps, scrim, bonding seed waste debris, loft and color. Every sample of batting, and quilted samples, washed and unwashed, were then labeled as such. All muslin used in the samples is 100% cotton and was pre-washed in hot water and dried in the dryer and ironed smooth using a steam generator iron. The thread used for machine quilting is mercerized 100% cotton. The thread used for hand quilting is glazed 100% cotton. Hello, Welcome to my blog. My name is Debra, I have been an avid quilter for 20+ years with a passion for needleturn applique.I have a blog about raising backyard chickens and my Thread Caddy in addition to my batting blog.